The 4502 has the critical accuracy necessary for urine output measurements. Calibration is in grams providing a one-to-one relation to cc's of urine for easy, rapid calculations. Pounds or ounces may also be selected. High sensitivity also makes the 4502 perfect for a number of other weighing needs: laboratory animals, sanitary pads for mothers' blood loss and O.R. sponges. 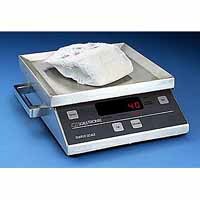 Weighing Range - 1000 gm. Readout - Digital LED in grams, pounds or ounces. Automatic shutoff. Dimensions - 8"w X 11"d X 3"h.
Construction - Heavy-duty stainless steel. Platform Size - 8 1/2" X 8 1/2". Handles - 3 handles provided. Power Source-Cordless - 6 â€œCâ€� batteries â€“ 10,000 weighings. External adapter is available for line-power operation.